Top quality bulbs, the more you buy, the more you save! COOL WHITE. APPROX 50,000 SWITCH CYCLES. HOWEVER, WE WILL DO OUR UPMOST TO HELP WITH ANY CLAIM MADE. INSTANT FULL LIGHT. Manufacturer : KOSNIC. 28w GR10q 2d average rated 12000 hrs. 28w Gr10q 2d. Cap/Base : GR10Q. Energy Saving Light Bulb. Similar Incandescent. Energy Saving Light Bulbs. LED Light Bulbs. A Kosnic 12w 4pin 2D LED Lamp in 4000K (Cool White), equivalent to a 28w 2D compact fluorescent lamp. This lamp has a GR8 cap. For sale - 1 x GU10 LED Dimmable light bulbs - KOSNIC LED GU10 6W. Colour Temperature 3000k ( Warm white). Length 55mm. A energetic efficiency class. Durability 35,000 Hours. 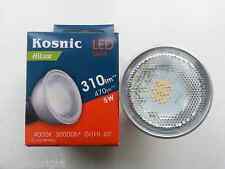 KOSNIC ENERGY SAVING LAMPS 11w/15w/20w/24w 6500K DAYLIGHT SPIRAL- IN STOCK!!! Dimmable specification. Safety fused. 18 Watt = 25 Watt Halogen Energy Saving. Quality Long Life Bulbs are as follows Quality approved bulbs. Clear bulb spec. Even distribution through excellent rendering. 28w Energy equivalent to 40w Brightness. Fully Dimmable. Eco Halogen to make huge savings on your electricity. Details of the Quality Long Life Bulbs are as follows 2000 Hour average life. Kosnic 6w GU10 Lamp. LED GU10 LAMP. Natural White. NO LED BULB WITH LAMP. Lamp Base: 4 Pin. Beam Angle: 120 Degrees. Kosnic code: KPRO06PWRT/GU10-S65. 6W LED GU10 - Perfect 50w Halogen Equivalent. 35000 Hour Average Life. 3 Year Warranty. Job lot of 10 Kosnic 1w Golfball Es White. 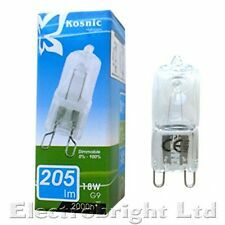 Kosnic 6W 12v 5.3 (MR16) reflector lamp. Warm white colour. Top Quality 4.5 Watt Kosnic GU10 LED Bulbs. Kosnic reference: KPRO04.5PWR/GU10-S30. Minimum 85% Energy Saving. Warm White specification. 45 degree bean. 35000 Hours - Long Life. Instant Full light. Kosnic's LED Bulkhead offers a low maintenance and robust solution to lighting in corridors, staircases and security zones. The standard fittings are exclusively for use with Kosnic LED DD lamps with or without microwaves sensors, are suitable for outdoor use (IP65) and have the option of a built-in emergency module. Finished - White with opal effects. Dimensions - Diameter 280mm x Depth 60mm LED DD lamps are available in our eBay shop. Condition is New. 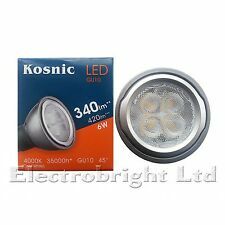 Kosnic 18W DD 4 Pin LED 38W Equivalent. ● 4 Pin GR10q Base. ● Cool White 4000K. ● 30,000hrs Lamp Life. ● 38w Equivalent. •28w Energy equivalent to 40w Brightness. •Fully Dimmable. •Eco Halogen to make huge savings on your electricity. Details of the Quality Long Life Bulbs are as follows •2000 Hour average life. 12W 4000K Cool White lamp with 30,000 hour average lamp life. This 4-Pin DD Style LED lamp can save energy up to 65% comparing with traditional Fluorescent 2D fittings. Main Colour White. Color Temperature Cool White. 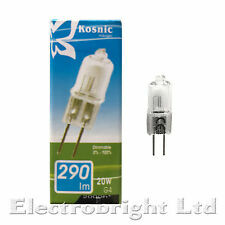 Kosnic EXUN-DD 2 pin (GR8) 1200 h 1 box of 16 bulbs. Job lot of 44 Pieces! 12w Standard LED DD lamp included. Finished - White with opal effects. 18W 2700K very warm white lamp with 30,000 hour average lamp life. This DD Style LED lamp can save energy up to 65% comparing with traditional Fluorescent 2D fittings. Main Colour White. Color Temperature Very Warm White.